IT IS A STRANGE EXPERIENCE for some Protestants to attend a service at an Anglican or Episcopal church. The sermon may be as good or as bad as elsewhere, but the prayers, rather than spoken extemporarily, follow a set form of words. Many are surprised to learn that such liturgical prayers were the norm in nearly all the sixteenth-century Reformation churches. Neither Luther, Calvin, Zwingli, nor Cranmer thought it unscriptural to use set prayers. There were set prayers in the Old Testament (e.g., the Psalms) and in the New (e.g., the Lord’s Prayer). Their only concern was to have good set prayers, not bad ones. Though this concern drove all the liturgies produced in this era, none came off as successfully as did Thomas Cranmer’s Book of Common Prayer. It has become not only a classic of English literature, but more important, its cadences and theology have spiritually nurtured millions of Christians for more than 400 years. The Prayer Book, as it is also called, was first published in 1549–1550. It contained the orders of worship for various services (morning and evening prayer, Sunday Eucharist, Ash Wednesday, and others); each service included instructions on when to stand, sit, and kneel, and the many prayers and litanies worshipers were to use. The Prayer Book has been revised several times—and several times suppressed. 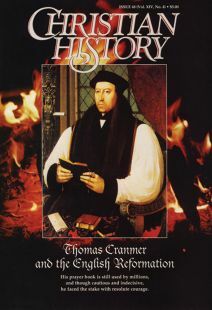 Cranmer himself revised it in 1552 to bring out its meaning more explicitly. At the same time, he attached to it a confession of faith (the Forty-Two Articles, later revised to become the Thirty-Nine Articles of Religion). When the young reforming king, Edward VI, died in 1553, Queen Mary attempted to restore Roman Catholicism and so banned the Prayer Book. After Mary’s short reign, Elizabeth brought the Prayer Book back, in a slightly amended form. It was slightly amended again by James I in 1604, but in the English Civil War (1649–1660), when the Puritan party ruled England, it was banned again. After the restoration of the monarchy, the Prayer Book returned once more, with many small amendments but with its general character and quality unchanged. Though there have been further revisions among non-English Anglicans, the 1662 form is used in England to this day. To Cranmer, and other Reformers, carefully thought-out phrases, based on Scripture, were likely to better express one’s intentions than the suggestions of the moment. And if the prayers were fixed, people could get to know them, think about them, memorize them, and enter fully into their meaning. But Cranmer had inherited a vast corpus of medieval liturgies, so he was faced with a number of tasks. First, these services needed to be translated from Latin into English. Second, unscriptural teaching needed to be replaced by biblical teaching. Third, he wanted to simplify and condense the five medieval manuals of worship into one volume. Finally, he wanted to revive the regular, orderly reading and preaching of the Bible. Some of the Reformers, notably Zwingli and to some degree Calvin, thought it best to abolish the old services and start again. Cranmer, along with Luther, thought it better to keep what was good in the old services and simply change what needed changing. Two examples of what Cranmer preserved, by translating Latin prayers into English, are the following collects (prayers that “collect” or summarize the theme of the service). In some instances, Cranmer composed something afresh. Take these examples. Just a few words and phrases need a comment: “world without end” (age without end), “faithful people” (believing people), and “quick and dead” (living and dead). But the biblical allusions in these prayers are easy to see (particularly John 14:31, Acts 9:31, and Romans 13:12 and 15:4), and the language, amazingly, is still accessible today. Cranmer called it the Book of Common Prayer because it was intended for the whole nation, clergy and laity alike, and all classes of society. Though illiteracy was still widespread, he wanted everybody to have the book in hand and to read it as well as hear it. The fact that the Book of Common Prayer has worn so well is some indication that he succeeded. Today the Prayer Book is again under attack for its occasional obscurities (though one wonders whether Cranmer’s theology is often the offense). At the same time, in some free-church traditions, liturgical worship has been revived. But no liturgy produced in the last few hundred years has equalled Cranmer’s, either for biblical content or for power and grace of expression. Roger Beckwith is acting warden of Latimer House at Oxford University. He is author of The Service of Holy Communion and Its Revision (Marcham, 1972).